We're big fans of Ella's Kitchen in our house. 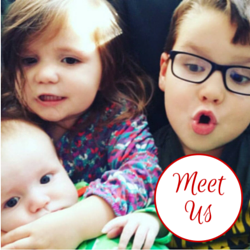 Their range of weaning pouches and snacks have been staples over the past five years as both Bud and LM have grown up and we've featured them on the blog several times too. The lovely team at Ella's Kitchen offered Bud and LM a little gift on the arrival of their new baby brother and they were so pleased with what we received. Bud and LM received a t-shirt each proclaiming their new status as a Big Sister (for LM) and a Big Brother to two (for Bud). LM really loves her Big Sister tee and can often be found pointing to the words and saying 'Sister' to everyone she meets. 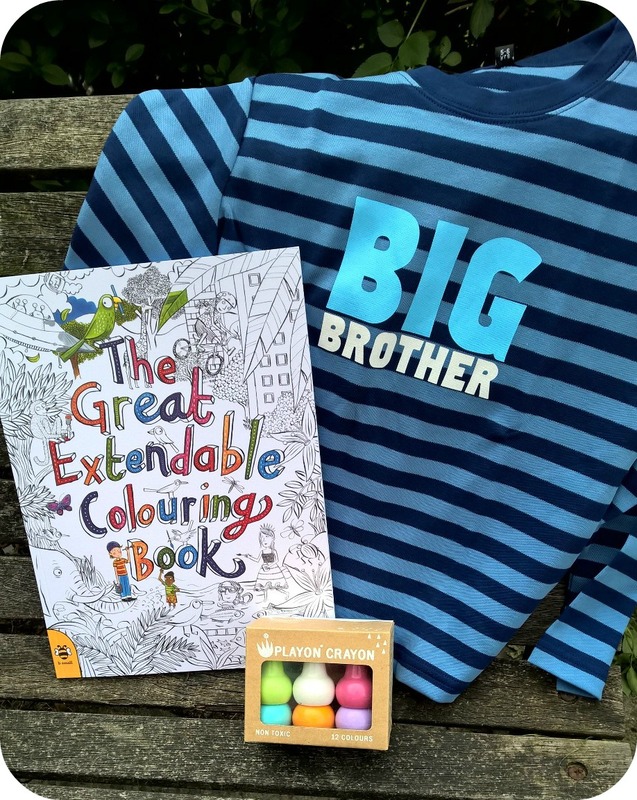 They also received a fab extendable colouring book and crayons to keep them busy while I'm occupied with their new baby brother. In addition to these exciting items they also received a selection of the yummy Ella's Kitchen products. LM especially loves the fruit smoothies pouches and she was really pleased to try 'The White One' as we haven't bought this flavour before. This is a yummy mix of 100% coconut milk, pineapples, bananas and apples, with a dash of lemon juice They are such a tasty, convenient snack and I can usually be found with a few of them in the bottom of my changing bag in case she gets peckish when we're out and about. Both Bud and LM enjoy the snack range from Ella's Kitchen too. The Bananas and Raisins Nibbly Fingers are another convenient on the go snack and one of LM's favourites. The ee i ee i oh Spelt Cookies were new to us but both children enjoyed them, they didn't last long at all! 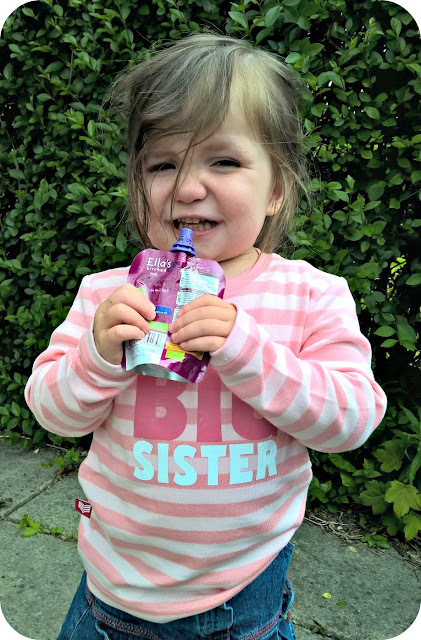 Ella's Kitchen sent us the parcel as they were so excited about the birth of Princess Charlotte, and wanted to celebrate with lots of little ones who have recently welcomed a new brother or sister, just like Prince George. They've even created their own news bulletin to report the safe arrival of the little princess! 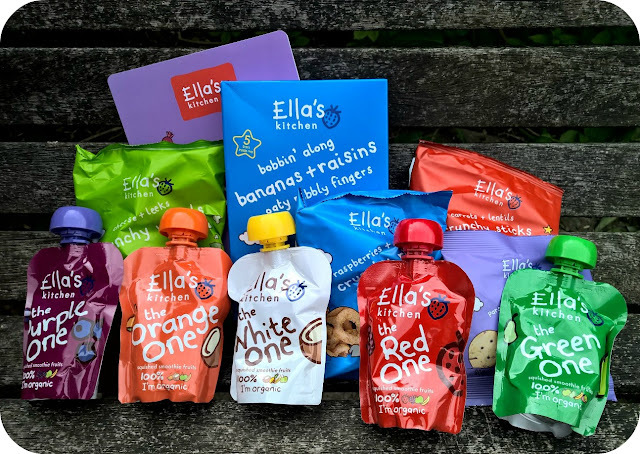 Ella's Kitchen is a trusted brand in our house and one that I'm sure we will continue to use for a good few years yet, whether with LM still enjoying the toddler snacks or as Little E starts on his weaning journey in a few months. We've so enjoyed celebrating both Princess Charlotte and Little E's arrival with them!